As I was afraid of, after looking at this morning's data, there is a serious risk of tornadoes, perhaps strong tornadoes, over parts of Kansas and Oklahoma on Mother's Day. I worry about tornadoes on holidays because people are often preoccupied with celebrations and travel. 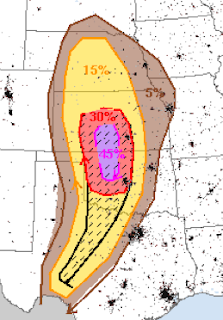 The hatched area is where strong tornadoes and hail larger than 2" are forecast to occur with the higher odds in Kansas and Oklahoma. I'll update on this risk tomorrow. Mike, what do you think was the primary reason why NOAA SPC decided to drop the moderate risk? I am just glad they did. Now if they would just drop this enhanced risk, I could relax even further. Got family in Wichita today. Thanks Mike for all that you do.